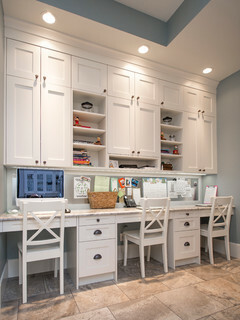 Remember that if your computer screen faces the window you will get a lot of reflection and glare, so good window coverings will be key. 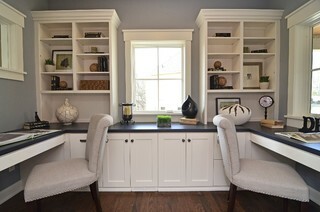 This is an improvement on the one-wall design in that it offers extra storage space for both users. The peninsula in the middle can house file drawers or perhaps a shared printer. If two people will be facing each other then the centre of the “T” should be wider to ensure there is enough space for both. Last but not least, the reverse “L” is a great layout if you will be meeting with other people in your office. 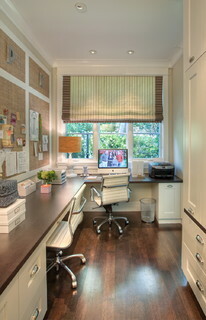 Or, if you would like us to create a home office for you, contact us for a complimentary in-home consultation.